Sometimes the most difficult stories to tell are the ones that are the most important for others to hear. 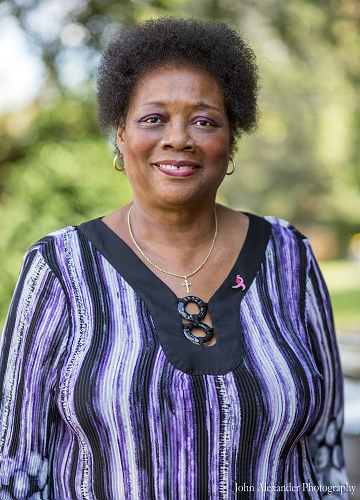 The story of November’s Survivor of the Month, Henrietta Taylor, is one that in some ways shares similarities to the stories of many other survivors. Her story is one of grueling treatment regimens and painful complications. Her journey, like that of many survivors, is the story of the scars that have healed and the ones that she still carries with her to this day. Yet in other ways, Henrietta’s experience has been unique from any others. There is a strength and courage to Henrietta that she has the ability to convey in only a few words. She has a sense toughness that allows her to, in one breath, describe chemotherapy as seemingly not a big deal, but then just a moment to later describe a radiation session that burned her skin so badly that her treatment had to be postponed to allow her time to heal. Henrietta has a determination that propelled her through her battle with breast cancer and seems to be a cornerstone of her character. It was in the middle of the winter of 2010, a time of year when the biggest concern of many women is preparing for the holidays, that Henrietta got terrible news. She had breast cancer. The next several months of her life would be a roller coaster of doctor appointments and waiting rooms that would culminate in a treatment cycle in which she would have 30 separate radiation treatments over the course of less than a month and a half. Henrietta’s challenges were not limited to just the standard treatments. Not long into her healing she learned that she had developed lymphedema, a condition common among breast cancer patients, which is characterized by painful and persistent swelling in the arms and legs. Controlling the swelling was yet another mountain for Henrietta to climb. “I went through therapy to reduce the swelling in my arm. They (the doctors) exercised, massaged, and wrapped it for six weeks, three days a week. I used a machine to massage it every day. I did that for about a year.” The effects of the condition are longer lasting than some of her other complications, and to this day Henrietta must wear a sleeve on her arm both day and night to control the swelling.